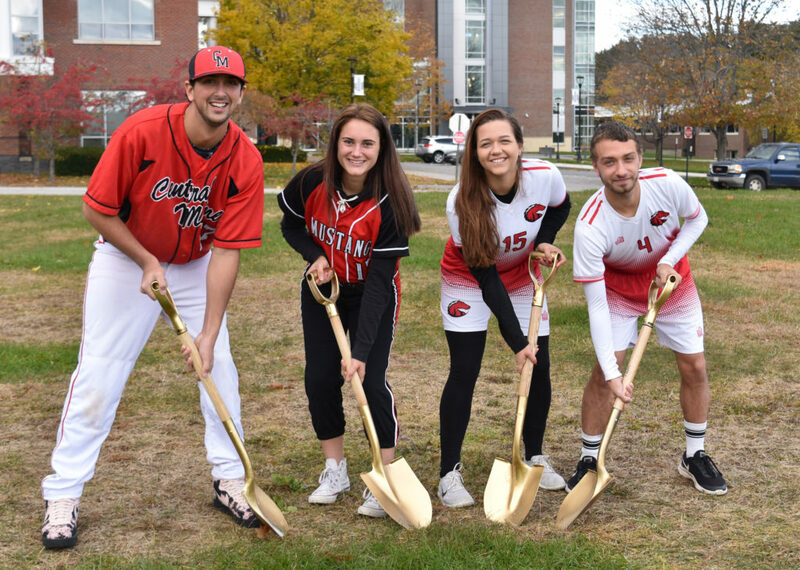 Breaking ground for the new athletic complex at Central Maine Community College are left to right student athletes Nick L’Heureux, Samantha Belardo, Keara Hunter, and Cody Dolloff. The synthetic turf facility will include baseball and softball diamonds and a soccer field. Work will begin in early spring on a new and expanded athletic complex at Central Maine Community College that will include lights and a synthetic surface. Fields will be ready for play fall 2019. “The new fields will be a tremendous boost to our athletic programs,” noted CMCC Athletic Director Dave Gonyea. “Currently, the soccer field is not up to collegiate standards, and our baseball and softball teams have to play off campus. This will allow us to schedule all games on our own facility, increase practice time and flexibility, and save on rental fees,” he added. The lights will increase significantly the availability of the fields, especially during the spring and fall seasons when daylight hours are limited. In addition, the synthetic turf will require significantly less maintenance, and the fields will not have to be “rested” like natural grass fields. They will also require no water or pesticides. C.H. Stevenson, Inc. of Wayne is the general contractor for the project. Excavation is expected to begin in early spring and the fields should be ready for use in fall 2019. In addition to women’s soccer, softball, basketball, volley ball, and cross country, CMCC offers soccer, baseball, basketball, ice hockey, and cross country for men. The hockey team plays at the Norway Savings Bank Arena, just down the road from the campus.